EnergixCharge Reviews - Is It a Scam or Legit? Charging your phone is as easy as it’s ever been with the EnergixCharge, a home or auto wireless charging pad that can charge your phone without the use of annoying cords. EnergixCharge is a wireless mobile phone charger with home and car versions. The product offers the ability to charge your phone without using a cord. The process is called “inductive charging” and uses electromagnetism to charge the lithium-ion batteries found in the majority of today’s mobile phones. The company behind the product is BlueSky Investments, LLC, which, according to the terms and conditions found on the EnergixCharge page, is based in San Juan, PR. Aside from this, we weren’t able to find any more information about the company. However, what’s most important is understanding how EnergixCharge wireless phone chargers work, how much they cost and how they compare to competing products. To figure out all this information, we dove into the user manuals for each product as well as the information available about the chargers on the product’s website. As we mentioned a few seconds ago, there is a car and home version of these chargers. The home version is a low-profile black disk upon which you put your phone so it charges. The car version looks like the average kind of holder you’d install to keep your phone in one place while you drive. To charge your phone on the home charger, you simply lay the backside of the phone down on the charger and leave it there until your phone is at the desired level of battery power. The car charger is a bit different in that you have to push the phone into a bracket that holds the phone while it charges. Either way, it takes just a matter of seconds to start charging your phone. So, in reality, the charging base is energizing the adapter, which then sends the charging power to your phone. Now, the EnergixCharge website doesn’t say how long it will take you to charge your phone. Some of that has to do with which phone you have – EnergixCharge supports more than 30 phone brands, including Samsung Galaxy S6-S8 and iPhone 8’s and above. However, we were able to find an article from tech site How-To Geek that noted that it took 1.48 hours to charge a Samsung Galaxy 6 with a regular charger and more than twice as long to charge it with a wireless charger. The main reason it takes a wireless charger longer to charge a phone is that it’s not as efficient as a wired charger, which can transfer the charging current down the cord to your phone without losing a lot of the current. The wireless charger, on the other hand, isn’t as effective because the forces it’s using to charge your phone can escape much easier than currents traveling through a cord. According to the user manual for the car charger, we found that it’s 73% efficient. This means that 73% of the charging energy in the charger will be used and 27% of it will be lost. The manual for the home charger did not include an efficiency percentage. Whatever the efficiency is for the two chargers, the principle is the same – it's going to take longer to charge your phone with a wireless device rather than a wired device. “None of this is the end of the world. You’ll have an okay experience if you use wireless charging. Your phone will probably charge fast enough, as long as you’re not in a hurry, and the extra power shouldn’t be a noticeable drain on your electric bill,” the How-To Geek article pointed out. Phones not included in their list will require a Qi adapter, which you can buy from EnergixCharge but are also available online through a variety of retailers. Both the home charger and the car charger are, at the time of writing, $49.99 each. The adapter you need to make the charging work is $15.99 whether you’ve got an iOS phone or an Android phone. To get a sense of where this product’s price tag fit in the context of all charging pads, we headed to Amazon and did a search of the top-rated wireless charging pad. 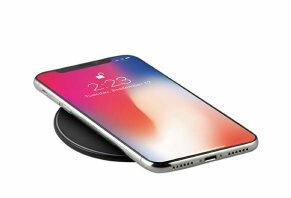 With such highly-rated wireless charging pads on Amazon at competitive prices, it’s hard to say that EnergixCharge wireless chargers are a good value. For example, the Belkin pad is made by a well-known electronics manufacturer. If you value reputation, then Belkin is the better value because not only is it from a brand name but it’s cheaper than the EnergixCharge. If you’re the kind of shopper that’s looking for a good bargain, then the Yootech charger seems like a good fit because its price tag is more than a third of the cost of the EnergixCharge. Whichever product you choose, make sure you know if your phone is Qi compatible and, if it’s not compatible, by an adapter for it. The EnergixCharge car and home chargers are stylish products that we think serve an important purpose for those who want an easy way to charge their phone without using cords that can get tangled amid the life’s usual tasks. It can be frustrating to get your hands or legs tangled in a charging cord while you’re driving and equally maddening if your foot catches on your phone cord getting out of bed and yanks your phone off your nightstand. However, EnergixCharge is just one of many products offering wireless charging for mobile phones. Based on the research we did on Amazon, there are comparable products that are less expensive. Whichever phone you choose, remember that it needs to be Qi compatible. If it’s not, you’ll need to buy an adapter. These things are the biggest scam I've ever seen. Not only are they expensive, they do not work, and there is absolutely nothing that can be done about returns or refunds. The Better Business Bureau will be hearing from me. If I could give a negative star, I would. First, it took over a month to finally receive the product. When it finally came, it was a worthless piece of crap that didn't charge my phone (even with the adapter). When I contacted the company they told me to send it back to an address in Florida and to email them the tracking number. I did so, then still nothing. I contacted them again, and got a response saying "we're still reviewing the return," it may take 30 days for a refund. It had already been nearly 30 days at that point. I've contacted them again and again now, an no response. No refund. This place is a total fraud. DON'T FALL FOR IT! I ordered both the wireless and car wireless (multiple) chargers with adapters for iPhone 6s and 7s. I received the charging pads but never received the auto charger nor the adapters for the iPhones. I have sent emails to the support address with no response. As I understand from searches and reviews, the company is no longer in business. With that said, it appears to be a scam built upon an advertising story that would be a great idea if it had been carried through. I suppose before considering this type of technology, one should realize that if there is one brand, there should probably be more. For me, I wasted some very hard earned money. I suppose I am the type of guy that these scammers go after. Hopefully not anymore. It has taken me several weeks to just earn the money I spent back and to apologize to the people that I had purchased these as gifts, promising them the adapters as soon as I received them. As of this writing, no adapters, and what I did receive is worthless. Be careful out there when dealing with something that sounds good, but as the old saying goes, too good to be true. Note, I have multiple order numbers and also received a warranty. Bottom line, do not purchase this type of tech from anyone other than a reputable brand name such as the manufacturer of your phone or other device. I bought EnergixCharge which promised to solve all my phone battery problems. It cost $55. Not only didn't it solve any problems, it didn't even charge the phone. It is the same type of charger that my son purchased at Walmart for $9.99. I sent the charger back but never saw the money for it. I strongly recommend against it. I bought that product which promised to solve all my batteries problems. It cost $50. Not only it didn't solve any problems, it didn't even charge the phone. Calling the customer services I got all kinds of running around. I sent the product back but never saw the money for it. I strongly recommend against it. I ordered 3 iPhone 6 chargers for $101.95 and they didn't work. I called and was told I needed an adapter and Ashley told me she would send me 3 adapters right away at no charge for me. Six weeks went by and no adapters. I called in talked to Steve and was told they had stopped making the adapters and they would give 30% of my money back as a credit and I said NO. He said okay, he would give me my money and I had to pay the shipping! They sold a product knowing it didn't work. A scam. This company is awful. First, I ordered multiple items December 1st for Christmas gifts. I travel for the holidays so I start with enough time to get and be able to take the gifts with me. The order arrived mid-January. Then what did arrive was a joke. Their products are inferior and their customer service is awful. I would HIGHLY recommend no one buy from this group. What arrived did not work at all. Then it ended up costing me $12 to return their crap and they still didn't refund me. I had to open a claim with my credit card. Awful and frustrating. DO NOT buy from EnergixCharge is my recommendation. This is supposedly a US-owned business but I could not even get an address to complain to. The owner according to PayPal is BlueSky Investments LLC. I asked for the address from the online support center and no one could provide it. Frustration is all you get with these guys. I will not order from a Facebook ad again. When ordering, the ad didn't specify which number iPhone the charger could be used on. There was no indication on any of the papers arriving with the product. I found it can be used on iPhone 8 and above. The device didn't charge but took away power on my phone. Not what I expected. It is past 30 days since my purchase, therefore, I cannot get a refund. The product has shown nothing exceptional and almost is harder to charge vs. the traditional charger for iPhone. It slips off the charger and you don't even know! Also, I have sent Support three email over the last four weeks. Not a reply. Caution! This company is a scam. The product did not work with iPhone 6 as advertised. Then the nightmare started - impossible to reach by phone or email. When I finally got a return slip after days of trying and mailed it back, they are saying it never arrived - so no refund. Fortunately, I paid via PayPal and can file a dispute. This company is fraudulent and should be held accountable! Write a Review for EnergixCharge!